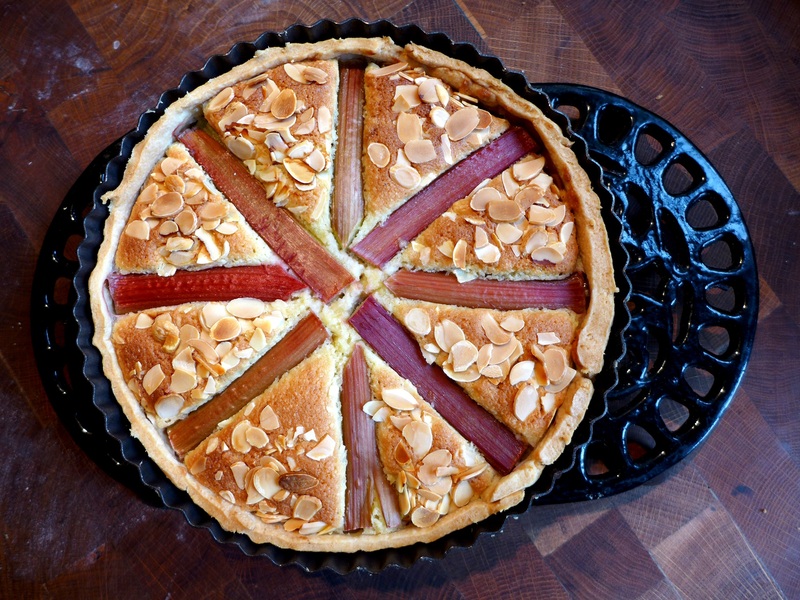 The first time I made this the rhubarb sank without trace and the flaked almonds slid inexorably sideways as the topping rose. Then I glanced at Instagram to see a five year old had knocked up a perfect rhubarb frangipane tart after she got home from school. Her mum Jess says she’s hoping for a three course meal by the time the prodigy hits 10. This is slightly different in that it’s a Bakewell tart topped with rhubarb, ie it has the sophisticated and very adult addition of a layer of raspberry jam. You can fiddle around arranging the rhubarb and nuts or just chop and scatter, it’ll still look and taste good. Just try to live up to the standards set by young Neve and you can’t go wrong. NB: most frangipanes these days don’t contain flour and baking powder. This one does because it’s an old-fashioned English recipe and reminds me of my mother’s Bakewell tarts. You can leave them out to no ill effect. This is best eaten on the day it is made. Make the pastry, form into a flattened ball, wrap and chill for 15-20 minutes. Pre-heat the oven to 200C/400F/Gas Mark 6 and put in a baking sheet to heat up. Roll out the pastry and use to line a loose-bottomed flan tin. Spread with a thin layer of raspberry jam. Chill again while you prepare the topping. Put the flour, ground almonds and baking powder in a bowl and give them a stir. In another bowl, beat the caster sugar with the butter until pale and creamy. Add the whisked egg a little at a time. Fold in the dry ingredients with a metal spoon. 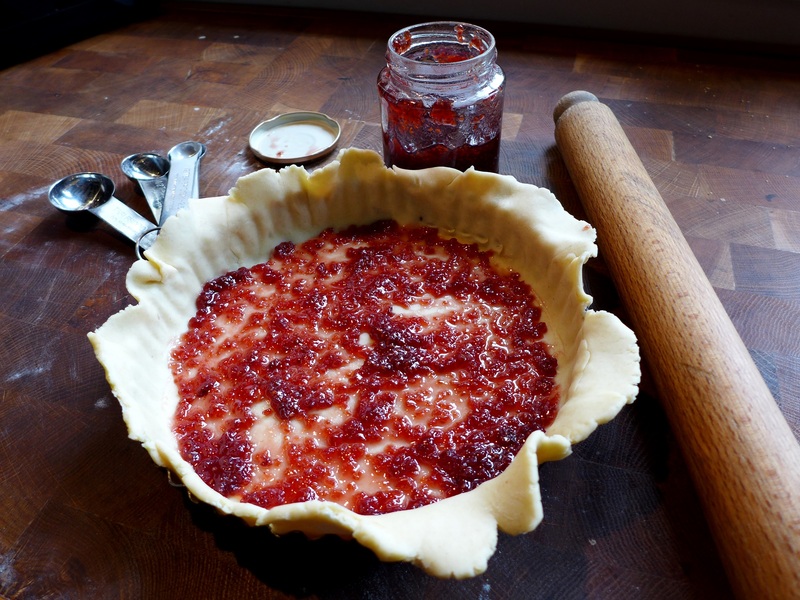 Trim the edges of the pastry and top the jam layer with an even layer of frangipane. Arrange the rhubarb and flaked almonds as you’d like them: I abandoned a poncy spiral for a more rough and ready treatment. There’s no need to press them in as the frangipane will rise around them. Place on the pre-heated baking sheet and cook for 25-30 minutes, until the pastry is golden and the frangipane risen and browned. Allow to cool slightly before removing from the tin. Eat warm or at room temperature, preferably with vanilla ice cream or creme fraiche. 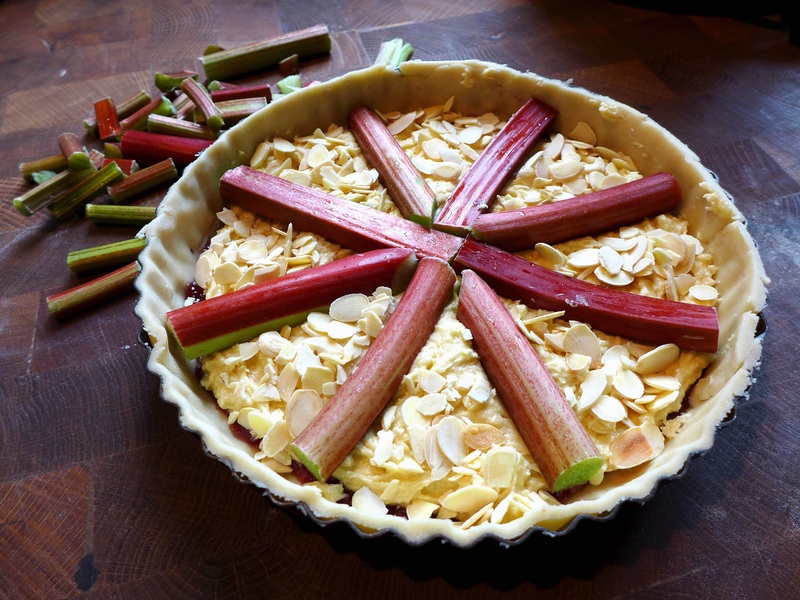 This entry was posted in Desserts, cakes and biscuits, Fruit, In the garden, Vegetarian and tagged rhubarb Bakewell tart, rhubarb frangipane tart, rhubarb recipes by Linda Duffin. Bookmark the permalink. You mean there’s an alternative to wolfing it down as soon as it’s come out of the oven 😉 ? That takes me back to my childhood, when we were given a saucer of sugar and a stick of rhubarb to dip into it … a home-made sherbert fountain! Your sous vide rhubarb sounds lovely. I still haven’t succumbed to the lure of a sous vide machine … how do you like yours? I can see it it can do magic to some cuts but it also takes some magic out of cooking, in my opinion: u cannot lift the lid to check how things are progressing, or taste a little bit ecc…. Oh my goodness that sounds Devine!! 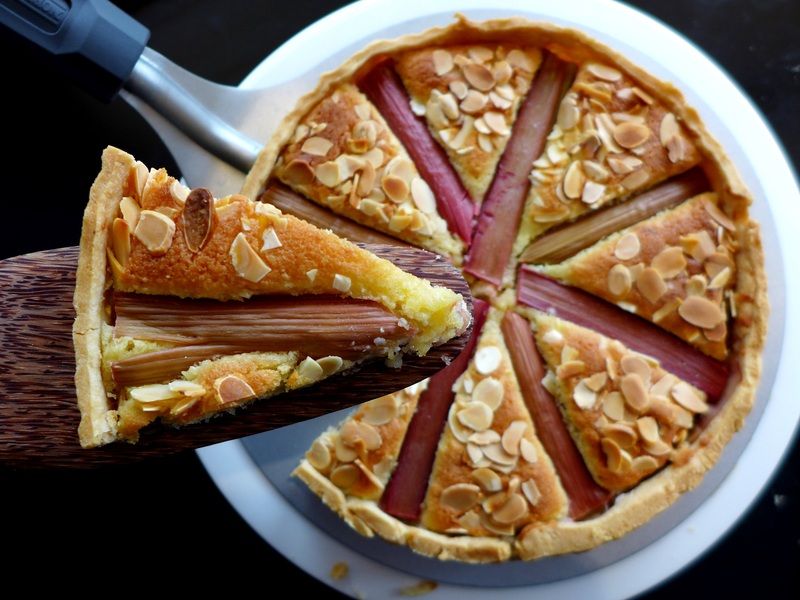 My two favourite things in the world are Bakewell tart and rhubarb 😋 I had thought that maybe the rhubarb was turned into a jam to replace the raspberry jam…either way I bet it’s delicious. Definitely going to have a go of this. Oh lovely, this sounds wonderful. Can’t decide between custard and creme fraiche. And I didn’t know you could eat rhubarb raw!